Yandang Mounain is situated in Leqing Wenzhou in the southeast of Zhejiang Province. As one of the 10 famous mountains in China, Yandang Mountain is well known for its three perfect scenic spots — Lingfeng Peak, Lingfeng Rock and Dalongqiu Waterfall. If one enters the Dalongqiu Waterfall Scenic Zone from the entrance of the valley along the stream, one will first see the Scissor Peak, which changes the shapes when it is viewed from different angles. Now it looks like the bud of a yulan magnolia flower ready to burst; now, like a pair of scissors; now, a woodpecker catching insects; now, a big bear holding a tree with its arms; and now, a stone pillar piercing into the sky. If one walks forward a few steps and turns one head back, one will find it resembles a sailing boat…. When one walks between peaks, valleys and tall ancient trees, wondering where the Dalongqiu Waterfall is, one will suddenly enter an open land, where a long and narrow waterfall is falling down from the sky. It is the Dalongqiu Waterfall. The drop height of the Dalongqiu Waterfall is 197 m, ranking first of all the waterfalls in China; hence it enjoys the reputation of being No. 1 Waterfall on Earth. Though the waterfall is tucked away in the lushly growing tall trees that block out the sun, the steep cliffs where the waterfall is located do not have even a glade of grass. The waterfall runs down vertically from the barren precipices, assuming air of self-importance. 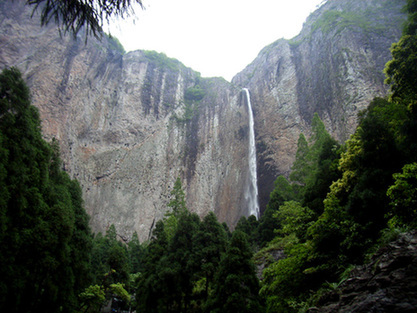 The Dalongqiu Waterfall originates from the mountaintop. At the beginning, the waterfall is only a thin water pillar, flowing down at a high speed. In the midway, the water pillar becomes thin sprays, dancing lightly. Like the drizzling in autumn, the thin sprays gently drop onto a green pond. Now the sprays look like a silver dancing dragon, and now, like misty notes, forming changeable patterns on the water surface…. The Dalongqiu Waterfall shows different sights in the four seasons and on the fine and rainy days. With scarce rainwater in spring, autumn and winter, the waterfall hangs down like a pearl curtain and turns into sprays at a certain height. The sprays revolve in the wind, moving up and down. Under the bright sunshine, visitors can see colorful rainbows. During summer, the volum of water dramaticly increases. The waterfall throws itself directly into the pond and shows a force of a thunderbolt. There is no through tickets for Yandang Mountain, but each tourist attraction in the mountain charges an admission ticket as follows: Lingfeng Peak (at night): 41 yuan; Lingfeng Peak (for the daytime): 41 yuan; Lingyan Rock: 40 yuan; Dalongqiu Waterfall: 40 yuan; Three-layer Waterfall: 15 yuan; Wild Goose Lake: 15 yuan; Sheep Horn Cave: 15 yuan; and Xiansheng Gate: 15 yuan. 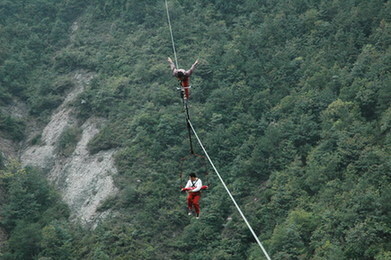 All the tourist attractions in Yandang Mountain are easily accessed by roads. Shuttle buses go directly to all the scenic spots; and tourists may reach all the scenic spots by driving a car. All the stone paths in the mountain are anti-skid, with gentle slopes, so old people and children can walk along the paths safely. Take a train from Shanghai to Yandang Mountain. The trains from Shanghai South Railway Station to Yandang Mountain include D377 (08:10-12:15), D3203 (10:50-15.01), D5585 (10:58-15:35), D5555 (13:18-17:27) and D5589 (15:00-20:06). After getting off the train, tourists may go to Yandang Mountain by taxi, and it will cost only 10 yuan. No scheduled flights from Shanghai to Yandang Mountains. Tourists may fly to Wenzhou, which takes one hour; and then take a bus from Wenzhou to the mountain. We suggest tourists go from Shanghai to Yandang Mountain by train. There are many hotels and restaurants in the district. Wenzhou Yinyuan Hotel is a three stars hotel. Tel : 0086-577-62245000. Chaoyang Shanzhuang Hotel is a three stars hotel. Tel: 0086-577-62245991. Yandang Shanzhuang Hotel is a four stars hotel. Tel: 0577-62245666. Tourists need book their accommodation three days in advance from every Monday to Thursday except public holiday.